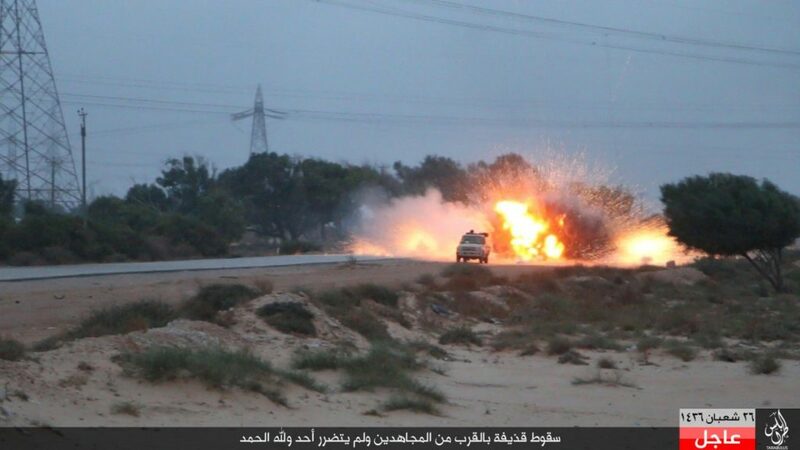 How many fighters does the Islamic State still have in Libya? When the Islamic State lost control of Sirte, Libya late last year, it was a blow for the so-called caliphate’s plans in North Africa. The group’s first spokesman, Abu Muhammad al Adnani, ranked Sirte just behind Mosul, Iraq and Raqqa, Syria in terms of importance. Adnani was killed in Aug. 2016 and Abu Bakr al Baghdadi’s loyalists were ejected from their urban stronghold on the Mediterranean several months later. But the Islamic State still has a presence in Libya and it is not clear how many fighters remain in the country. According to the State Department’s newly released Country Reports on Terrorism 2016, the group lost a significant number of its members during the battle for Sirte. Yet, several thousand of its men were either stationed elsewhere or survived. State also cites reports saying that the group had “as many as 6,000 fighters in its ranks” as of early 2016 — that is, several months before the US began its air campaign in Sirte in Aug. 2016. The number of jihadists fighting under the so-caliphate’s banner swelled between 2015 and 2016, as the Islamic State “doubled its presence in the country” during that time. Taken at face value, therefore, the State Department’s report suggests that approximately 4,300 members of the Islamic State’s Libyan arm were not killed during the operation to free Sirte from the jihadists’ grip. How many of them remain in Libya today? We don’t know. As FDD’s Long War Journal has warned, it is difficult to determine how many fighters the Islamic State has in Iraq, Syria, or elsewhere. The US government’s estimates have varied dramatically over time. State says that “up to 1,700 ISIS militants’ bodies were recovered in Sirte,” but it isn’t clear how firm that figure is. In addition, the self-declared caliphate could have had either more or less than the 6,000 fighters it was estimated to have in Libya as of early 2016. Those who survived the battle in Sirte, or didn’t take part in it, could have fled for neighboring countries, such as Tunisia or Egypt. They also could have retreated to other African nations, or further “abroad” to the Islamic State’s heartland in Iraq and Syria. All of this means that determining the number of Islamic State fighters left in Libya today is a task fraught with uncertainty. And the same goes for assessing the size of the organization’s membership around the globe. Since the loss of Sirte in late 2016, the Islamic State’s operational tempo has been relatively low, indicating that either it is not capable of carrying out regular attacks, or is seeking to regroup for the future. Still, taken at face value, the figures cited by the State Department suggest that the Islamic State could still have a significant footprint inside Libya. And we wouldn’t be surprised if this is the case. On a per capital basis, Libya and Tunisia exported as many foreign fighters (or more) than any other countries for the war in Iraq and the follow-on conflicts. And the Islamic State made Libya one of its top priorities from 2014 to 2016, reversing these flows by sending some fighters back to their home countries in North Africa. The US hunted down some of the personnel dispatched by Baghdadi in 2015, including Abu Nabil al Anbari (aka Wissam Najm Abd Zayd al Zubaydi) in November of that year. The Defense Department described al Anbari as “an Iraqi national who was a longtime al Qaeda operative and the senior [Islamic State] leader in Libya.” Other senior Islamic State personnel were deployed to the country as well. The jihadists’ effort became so important that US officials began to openly worry that Baghdadi’s men could use Libya as a fallback zone as they lost ground in Iraq and Syria. In Jan. 2017, the US bombed two Islamic State training camps south of Sirte, citing the presence of the group’s “external plotters.” The Defense Department estimated that dozens of jihadists were killed. Subsequent reporting revealed that the “external plotters” were connected to planned attacks in Europe. But that wasn’t the end of the Islamic State’s presence in Libya, as the jihadists had cadres sprinkled throughout the country. Abu Hudhayfah al Muhajir gave an inflated sense of his group’s capabilities. Time will tell how strong the Islamic State’s reconstituted presence in Libya will be. A number of scenarios are possible, including defections to other jihadist groups. But the State Department’s report warns that “many members of the terrorist organization” fanned out across the country and elsewhere after the battle for Sirte.